"What the hell is a NoobTune?" Some have asked me how and why i do what i do - the simple answer to that is because i can. I'm one of those people who can't resist knowing the ins and out of anything technical and if it's broken then that's a perfect opportunity to take it apart. If i can't fix it then it's still broken, but if i can then i'm a happy bunny. Engines in both bikes and cars definitely fall into this 'if it's broke then rip it apart' category. I've always seemed to have the knack of fixing stuff, which is quite lucky because living where i did it was a case of 'fix it or you're walking to work' and if i couldn't fix it then i learned! The other reason is i've never really been 'flush' and if i could make it or fix it myself then it saved me some hard-earned cash. I was ripping dead stereos apart when i was 5 and i'll always remember finding out the hard way that just because Lego battery leads will fit perfectly into a cassette player mains adapter it's maybe not a good idea to actually do it. I should really have left the wall switch in the off position before trying it too. It might not have stuck in the memory so much had i not been touching the little metal screws in the Lego connector at the time, although it did teach me pretty quickly that there's a significant difference between battery voltage and mains voltage. To answer the 'how' question; I started with a computer peripherals company when i left school and then onto an NDT company (where they let me "play" with radioactive isotopes!) then to an electroplating lab (they let me loose with chemicals!!!!!) and then moved into engine tuning working for a brilliant guy who just happened to own a Saab! It was all old-school stuff with carb's, jets, points, distributors with bobweights and springs - none of this computerised malarky. ECU's back then were resistors, transistors and the occasional full size logic chip - there wasn't a PC in sight. When the MOT added emissions testing to its list of checks, every man and his dog got in on the act and it was time to move on. Motor racing beckoned. No name dropping but you can't help but rub shoulders with a few 'names' if you're in the industry long enough. Travelled a lot, learned a lot more. My first Saab was a 9-5 2.0SE LPT which, as with most of my cars, i swore to leave stock. That vow lasted all of 12 months. Having the background described above (there was a reason for it you see, it wasn't just me waffling) the tinkering, electronics, computers and tuning all came together. Having had a few bad experiences of MG and Vauxhall forums in the past i wasn't planning on being a regular visitor to any others so when I joined the UKSaabs forum I just picked the very imaginative forum name of "SaabNoob" because i was new to Saabs. 6000+ posts later and i'm still there (I never did think that through). After unsuccessfully trying various old-school methods to extract a bit more go from my asthmatic LPT (and getting my wrists slapped by the ECU) I started studying ECUProject etc. After quite a few months of reading and digesting I raided my parts bin and made a BDM adapter on a piece of veroboard, got myself a spare T7 ECU, soldered some headers in place and flashed my first remap! You've never seen anyone drive a car so gingerly than me on that first test run. A dozen or more tweaks and twiddles later and a question came up on UKSaabs forum asking if anyone had sussed what to do with T7 mapping. Thinking i could help another Saabist in their quest for "ooomph" i answered asking what they needed to know but the reply was along the lines of "Oh it's way too complicated for me, i've given up, i was wondering if someone who HAS done it could do mine". He had the same car as me so i said "sure". After he left a glowing review on UKSaabs i had a few more requests for maps and was then approached by Johno with his 1998 9-5 Aero (Saabists will know that Saab didn't make a 9-5 Aero in 1998 so Johno did!). He'd taken a 1998 2.0SE and totally changed it so that even a Saab person couldn't tell it wasn't an Aero. Unfortunately the ECU and management system could tell and he was struggling to get more than stock LPT power from it even with a full Aero engine and Tech2 married Aero ECU. He turned up at my house one morning with ~150hp and 250nm of torque (stock LPT) and left later that day with 275hp and 420nm (stage 1 Aero). He was an immensely happy bunny and did a full write up on it. His project threads are legendary and his site http://johnossaab9-5.synthasite.com/ is a wealth of information for anyone wanting to modify their 9-5. My reputation grew and the immensely helpful and knowledgeable guys on UKSaabs kept recommending me: "Go to SaabNoob for one of his remaps", "you need one of SaabNoob's tunes", and so by pure fluke the "NoobTune" brand was created. 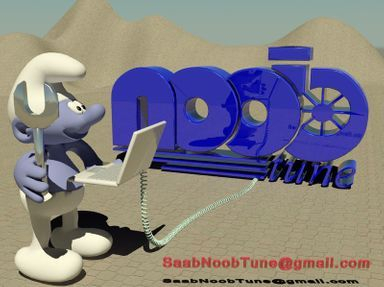 The NoobTune logo was the brainchild of another grateful map recipient and that became my avatar on UKSaabs and when Johno saw it he asked me for the JPG so he could have some stickers made for his car (he does like his stickers!) which then took off when other people saw them and started asking for them. I started doing all this simply because i could and i didn't have the money to pay a tuning house for one of their 'pro' products. If i hadn't been able to get my head around it then i'd probably still be driving an LPT. It's a hobby i love and i've met some great people in the process. I've had some good car parts given to me by grateful map recipients which has saved me mucho moolar when sludge and unscrupulous car traders have reared their ugly heads. I love Saabs and i enjoy being able to help people enjoy their Saabs. I prefer contact via email simply because having it all written down means i can check back on what advice and information i've given you months or even years down the line. Appointments for visits are available in the evening and at weekends, please email for latest availability. Prices start from £90. People question "why so cheap" to which the answer is "because i write and test the maps myself, i'm not a delivery boy who has to add his bit on top of the actual map cost because he's buying them in from someone else, i'm not VAT registered so there's 20% saved, and i don't have staff or expensive premises to pay for".